Some of those who played for Rovers in those days were Sean Cubbard, Joe Reilly, Paddy Lynskey, Martin Walsh, Paddy Cullinane, and various members of the Anderson family. As they began to accumulate trophies and participate in famous games, the legend grew. In the fifties they featured in some epic matches and among their players of that vintage were Michael Joyce, Martin Naughton, Josie McDermott, Gerry Ward, Jackie Bohan, Paddy Noone, John Madden, and Tim Griffin. In 1976, they were invited to play at senior level in the Bass League Cup, in which they drew with Finn Harps and Athlone Town before losing to Sligo Rovers. The following year they joined the League of Ireland, and played their first game against St Patrick’s Athletic. Chick Deacy scored their first league goal. For six months in 1978, members of the club worked hard to convert the Claddagh Hall into a sports and leisure complex, at a cost of £11,000. They eventually changed the name of the club to Galway United. 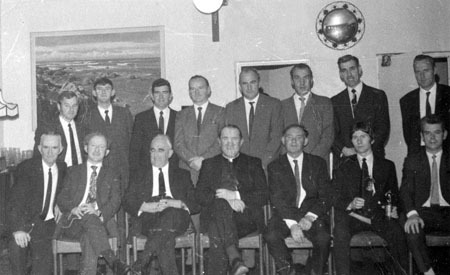 Our photograph today (which is courtesy of PJ O’Connell ) shows the committee of the club at their social in the Sacre Ceour in 1973. They are, front row, left to right: Eddie Cloherty; Michael D Higgins, vice president; Tom Burke, vice president; Father Gannon from the Dominican community; Joe McDermott; Brian Cassidy with his ‘Player of the Year’ trophy; and Billy Walsh. In the back row are PJ O’Connell; Peter Griffin; John McDonagh; Michael Mulvihill; Martin Moran, chairman; Matt Lee, manager; Tim Griffin; and Tony Moran. On Sunday next, November 27, there will be a Mass in the Jesuit Church at 11am for past pupils of Coláiste Iognáid and their families. All are welcome.